If you are a spa owner or manager, you know your customers will have high expectations from their visits with you. They’ll expect a peaceful and relaxing setting, excellent customer service and an experience that will leave them feeling like they’ve left all their troubles at the door. It’s up to you to provide this experience, and it’s up to you to know there’s a lot that goes into creating this experience for your guests. Many moving parts work together to create the perfect spa atmosphere. Part of it is staff. Part of it is architecture, design and furnishings. Part of it is customer treatment. These are all large pieces of it, and all these aspects are extremely important. But the little touches that go into setting your spa apart from competitors are essential, too. 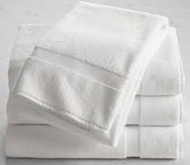 Towels are one of these pieces you may easily overlook, but it's impossible to overstate the importance of supplying the best towels to your guests. Today, we want to provide you with a guide to wholesale spa towels — how to buy them, where to buy them, what to look for in a quality towel and more. You might ask yourself, “How important is it to buy the right towels for my spa?” The answer is that it’s essential. It might be easy to assume, since every towel performs the same basic function of drying moisture, every towel is equal and works across all the same settings. And while it’s true you can use any towel for drying, it’s important to realize you should not use every towel for every purpose. For example, some towels can withstand bleach, while others can’t. By using a non-bleach-proof towel with bleach, you could easily ruin it. Other towels absorb more water, making them more appropriate for drying off after a long soak in a pool, while you could ruin a lighter towel by trying to use it to take in that much water. Based on even these few examples, it’s not hard to see why it’s essential to use the right towel for the job. It isn’t enough to buy a box of generic towels and assume they will work. They might get the job done, but they won’t be the best tool for the task. If you’re looking for the best, the softest and the most durable, you’ll have to be prepared to dedicate some time to your search. What Sets Spa Towels Apart? 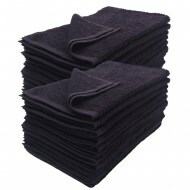 There are many different types of towels, designed for many different purposes. There are regular bath towels, intended for use in your home. Some of these may be inexpensive and fairly thin, while others may be extremely soft and fluffy. Another example of a different type of towel is a beach towel. These tend to be thinner and designed to dry quickly, as for use at the beach or the poolside. Fluffiness isn’t typically a big concern with these type of towels, and instead, it’s usually more important for these to be fun and colorful. Spa towels are something different altogether. 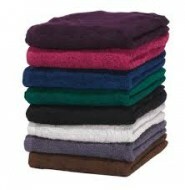 Spa towels are the most luxurious option. They should be soft, absorbent and incredibly fluffy. They should be highly comfortable and never rough. They should let the visitor know without words they’re visiting a high-quality spa, and you and your staff will treat them like royalty as long as they’re with you — right down to the towels themselves. One of the best ways to tell whether a towel is high-quality is by testing the weight. In most cases, higher-quality towels will have a heavier weight. 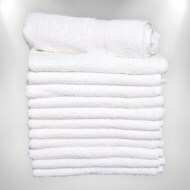 Because towels are such a relatively light object, most towels get weighed by the dozen, as opposed to individually. By way of comparing different types of towels and their quality, let’s look at what different styles of towels might weigh. 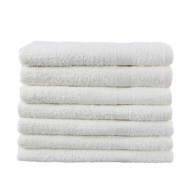 Bath towels: These lightweight, casual towels can range anywhere from five to 17 pounds per dozen. Beach towels: These are light and designed to dry quickly, making it no surprise that they typically weigh anywhere from five and 20 pounds per dozen. 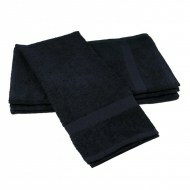 Spa towels: These soft, fluffy and high-quality towels usually weigh anywhere from 15 to 20 pounds per dozen. Worrying over different towel weights might seem like a small concern. You might ask yourself, “Who is going to notice if the towels weigh 20 pounds per dozen, or 10?" In reality, your guests probably won’t notice the weight difference. What they will notice, however, is the distinct drop in how the towels feel. They probably won’t realize this difference has to do with weight, but they will certainly notice something doesn't feel right about the towel — that it isn’t as thick and luxurious as it should be. The last thing you want to do is leave your guests feeling shortchanged in the towel department. Instead, you want your guests to leave your spa feeling satisfied, like they have just received the most luxurious experience of their lives. Towels come in all different shapes and sizes, and this is no accident. Each type of towel has a very specific, unique purpose to fulfill. Because of this, your guests will have the best experience when they’re using towels that are uniquely designed to suit the function they’re performing. 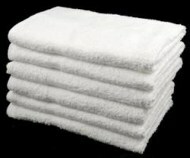 The following is a beginner's guide to the different size towels you will need to supply your spa with. Washcloth: This is the smallest size towel. These are usually a little square for scrubbing the face or body, and typically not for drying off. Hand towel: The next size up, these towels are a small rectangle typically designed to hang over a towel bar. People can use these for drying their hands after washing. Bath mats: These are slightly smaller than a traditional bath towel, and despite the similar name, you shouldn't confuse bath mats with bath towels. Bath mats are for spreading on the floor instead of a rug to keep people from slipping on a wet floor after a bath or shower. Bath towel: These towels are quite large, and are for drying a person’s entire body after a shower, bath or a dip in the pool. They’re large enough that they can also wrap around most people, providing a quick and easy cover-up before getting dressed again. Bath sheet: This size of towel is the largest of all. It is very similar to a bath towel, except that it is slightly larger, thus making it even more appropriate for use as a cover-up following a bath or a shower. 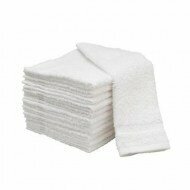 As a spa manager or owner, you will need to stock a wide range of all these different types of towels. Your guests will need washcloths, hand towels, bath mats and all the rest. By having a better understanding of what these different types of towels are, you can better understand how people use them, and why it’s important to stock them. 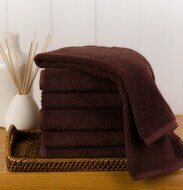 Another important distinction that separates different towels from one another is the materials that make them. Some use more expensive material, while others use more affordable material. Some are soft and fluffy, while others are more flat and coarse. There are all different kinds of towels, all designed to suit different purposes, budgets and settings. Cotton/polyester blend: This blend is typically 86 percent cotton and 14 percent polyester. It’s soft to the touch, while still being durable enough for frequent use. It’s an excellent choice if you’re operating on a bit of a budget. Open-end cotton: This material is 100 percent cotton, making for a towel that’s highly affordable if you’re working with a smaller budget. It’s also extremely durable and good for settings where it will experience heavy usage. 100 percent cotton: This material is also 100 percent cotton and highly absorbent. It’s also much softer than most cotton/polyester blends, creating a slightly more luxurious feeling than that of many blends. It is an excellent middle-of-the-road choice for almost any setting. Ring-spun cotton: This type of material is another variety of 100 percent cotton, this time with an extra level of silkiness. It’s durable, long-lasting and makes a perfect choice for establishments ranging from more casual to more upscale. Zero-twist cotton: This type of fabric is lighter, softer and breezier. It requires less cotton production to make, meaning it’s environmentally friendly, as well. Because it’s so light and breezy, it also has the benefit of drying more quickly. Egyptian cotton: The softest and silkiest of cotton fabrics, this towel material is extremely absorbent and dries faster than almost any competing material. It’s top-of-the-line material, making it an excellent choice for an upscale or luxury establishment. As you may know, most towels feature a decorative border woven into the towel about an inch or two from the edge. While this border doesn’t fulfill any functional purpose, strictly speaking, it’s a staple of most towels. Even though this border isn’t something we frequently think about, we would likely immediately notice if a towel did not have one, and would likely assume the towel was of lesser quality. These borders come in many different styles, as different manufacturers and companies sometimes choose to create their own. There are two styles that stand out above the rest, however, as being fairly familiar and easily recognizable. These two are the cam border and the dobby border. This border is typically a flat weave that is clearly visible on both sides of the towel, front and back. Not every cam border looks the same, but because the design is a simple flat weave, there isn’t enormous room for variation between designs. 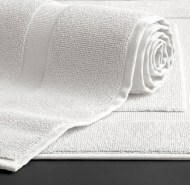 This design is a great choice for at-home towels, or towels at budget spas and establishments. The dobby border consists of a raised decorative weave that comes in several different variations. Some feature a checkerboard pattern, while others feature raised stripes. One variation of this style, known as the piano dobby border, features a striped pattern that looks quite a bit like piano keys. The dobby border has a reputation for being more upscale, making it a perfect choice for the towels at your luxury spa. As you stock your spa, whether you’re starting from scratch or just looking to replace a few items, you have a choice about how to purchase the towels you’re looking for. 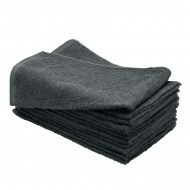 Going directly to a retailer to buy items such as professional facial towels might be the option you think of first. But it isn’t your only choice. 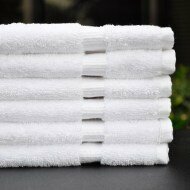 If you’re looking to purchase large quantities of towels, you might be better off buying wholesale spa towels, which means you’d be buying directly from the companies that typically sell to the manufacturers. The benefits of doing this are many and varied. For one thing, you’ll typically find this is the cheaper option. 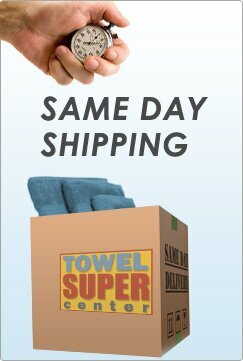 While buying from a retailer forces you to buy each towel you need, buying wholesale allows you to buy in bulk. 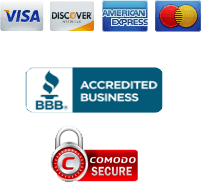 As a result, you can get large quantities of things like wholesale massage towels at a fraction of the cost you would spend buying each towel separately. In addition to this, you’ll likely have the added benefit of not having to depend on what’s in stock in a retail location. Instead, you can order straight from the warehouse itself, buying large stacks directly from the manufacturer without having to worry about the limitations of what you can find on the store shelf. For example, maybe you’re looking for a particular style, in just the right color, material and border, but the only stores that sell it are always sold out. When you buy wholesale, this is no longer a problem. You can buy directly from the company making the towels, and in many cases, you can even put in your special order directly, ensuring you’ll get exactly the towels you’re looking for. 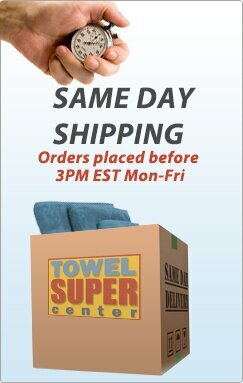 Are you looking to purchase wholesale facial towels, massage towels or more for your spa? If so, there’s a lot to think about. What material will you choose? What about color? How many will you need? What type of borders are you interested in? No matter what you’re looking for, we hope you’ll consider shopping with us here at Towel Super Center. 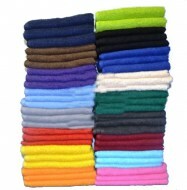 We take pride in offering quality wholesale towels at discount prices you can easily afford. We offer a wide variety of different style and types of towels, as well, meaning you can find towels to fit all your needs — whether you’re looking for spa facial towels, luxury options, affordable options, esthetician towels or more. 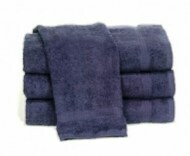 To get started shopping with us, browse our wide selection of spa towels and learn why so many others have trusted Towel Super Center with their towel supplying needs.